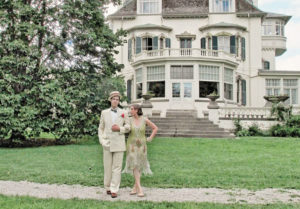 The Duke Live, 1225 Queen St. E.
The Wintergarten Orchestra will be the star attraction at the annual Gatsby Garden Party at the Spadina Museum, on June 22nd and 23rd from noon until 5 PM. This is perfect venue to see and hear the band, and you don't need a time machine! Hugh’s Room Live, 2261 Dundas St. W.
Beaches International Jazz Festival, 1695 Queen St. E.
Our last appearance of the summer will be at the 31st annual Beaches International Jazz Festival. See us at the Big Band Stage - it's free! Come see the Wintergarten Orchestra in the classic confines of Hugh's Room on New Year's Eve-Eve! It will be just like going to the Savoy!